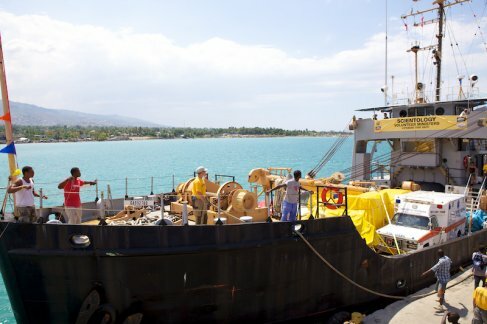 The "Lifeboat for Haiti" arrived in Port-au-Prince today. It is loaded with tons of supplies--everything from MREs (meals ready to eat) to crutches, medicine, cooking-stoves and an ambulance. All the supplies were donated by charities and everything is being distributed to charities in Haiti including schools, orphanages, hospitals and clinics. 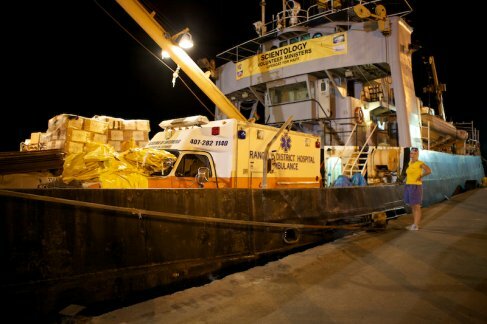 The entire team of Scientology Volunteer Ministers will be unloading and distributing the supplies tomorrow. The Hornbeam at the dock in Port-au-Prince, Haiti. 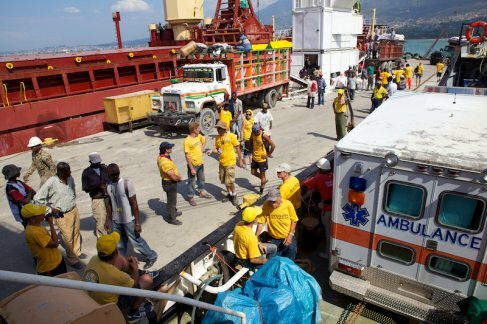 Dozens of Scientology Volunteer Ministers arrived to help unloading tons of supplies and aid material brought by the ship. Thursday night: Getting ready for a day of unloading.